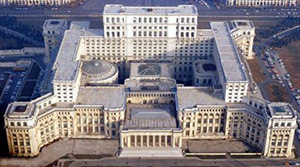 The Palace of the Parliament was built between the years 1984-1989 and it’s the largest administrative building in Europe. 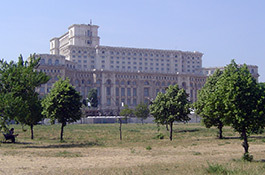 It is situated in the central part of Bucharest (the 5th sector), on the Arsenal Hill. The building has an area of 333.000 square meters and it is recorded on the second place in the Guinness Book of World Records in the section Administrative Buildings. The Pentagon takes the first place in the world in this respect. Being built on an artificial hill, more than 7 square km had to be demolished in order for its construction to be possible. Once the neighborhoods were demolished, so were several important buildings, such as: Vacaresti Monastery, the Brancovenesc Hospital, The National Archives and Republica Stadium. Ceausescu wanted that the residence of the presidency, of the Central Committee of the Communist Party and of several ministries to be here. The dictator didn’t spare any effort, but the inside of the Palace was built in a completely luxurious manner: long stairs made of marble, ceilings with ornament laces, mosaics in diverse colors, rich-carved doors, many chandeliers and crystal lamps, carpets that were executed on special commands, beautiful furniture items and many other things. The building is structured on 6 levels and divided in 21 parts and has 1100 rooms. When the Revolution burst out, only a few rooms and the exterior part of the Palace were finished. After the Revolution the construction of the Palace lasted till 1997, when it became officially the Palace of the Parliament. The building has an area of 333.000 square meters and it is recorded on the second place in the Guinness Book of World Records in the section “Administrative Buildings”. The Pentagon takes the first place in the world in this respect. According to the same book, the Palace of the Parliament lies on the third place in the world, regarding its volume (2.550.000 cube meters). The first place is taken by the Assembly Building of the spatial rockets from Cape Canaveral (situated in Florida) and the second by Quetzalcoatl Pyramid from Mexico. The building is structured on 6 levels and divided in 21 parts. There are 1100 rooms, 440 of which are bureaus, more than 30 are halls, 4 restaurants, 3 libraries, a concert hall and 2 underground parking lots. 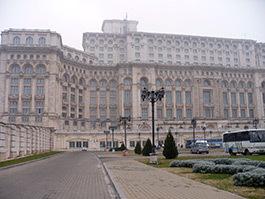 Palace of the Parliament, Bucharest. 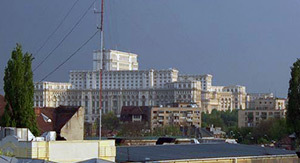 The building can be spotted from every corner of Bucharest and was regarded as a hideous building after the Revolution (many bad and weird things were said about it). Some people, out of revolutionary excitement, wanted the Palace to be demolished by dynamiting, because, they said it symbolized the past. Others thought that this building was useless and that a museum of Communism should be built instead. Eventually, it was even thought that the Palace of the Parliament was in fact a casino. When people figured it out that many money were there and being robbed without any discernment, the building wasn’t looked upon so hostilely and it was called” The People’s House”. 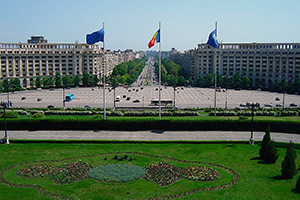 View from the Palace of the Parliament – Constitution Square, with 300 m longer than the Champs Alizee. In front of the Palace of the Parliament one may see the Constitution Square (Piata Constitutiei) (which is a place for shows, celebrations and parades) and after that the Unirii Boulevard (which was once called Victory of the Socialism), which Ceausescu wanted to be larger than Champs Elysees. The whole thoroughfare is full of various stone-made wells which are beautifully decorated. Their esthetic level drew a lot of controversies. 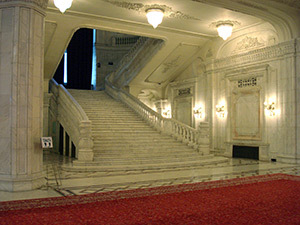 The 13th of September Entrance – The stairs are 30 m tall and 27 m wide and lead to the presidential bureaus. 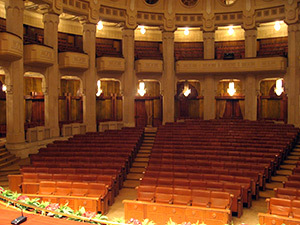 The names of the halls in the Palace of the Parliament were picked after 1989. These names conjure up important events from Romanian History and important personalities known worldwide. Most of them are linked to the Romanian people’s aspiration to the Great Union and to the history of the Romanian Parliamentarism. It consists of a large hall connected to the monumental stairs that lead to the first floor. Above the stairs, one may see a dome made of blue glass and a chandelier. The stairs are 30 m tall and 27 m wide and lead to the presidential bureaus. The originality of this entrance hall stands in the motif of the ceiling that reflects itself just like in a mirror in the decoration of the floor. This is a mosaic which was inspired by the one discovered at Histria. This mosaic reminds of the presence of the ancient Greek colonies that existed on our soil. 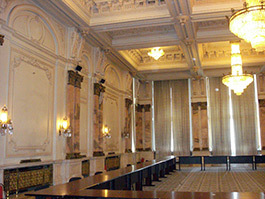 “The rights of man” Hall – Palace of the Parliament. 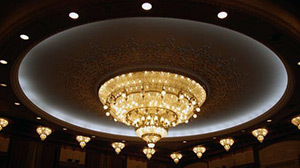 The crystal chandelier from Medias that weighs almost 2 tones “The rights of man” Hall – Palace of the Parliament. What makes this hall unique is the modulus made of two wooden pilasters, element which could be seen in the Italian Renaissance architecture. The ceiling is richly ornamented and the mirrors are made of platinized plaster. Here, as well, one may find a crystal chandelier from Medias that weighs almost 2 tones and an oak round table that is surrounded by 60 chairs made also of oak and velvet tapestry works. The carpet from this hall has the same motif as the ornaments on the floor (made of oak), ornaments that present various nuances of colors. 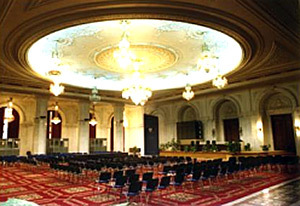 The Gallery of Honor and the Official Entrance Hall – Palace of the Parliament. It is a 150 long and 18 m wide corridor (150 m long), having oak made sliding doors in three distinct places, crystal windows, built on metallic framework. The gallery is illuminated naturally by 14 windows and gates. 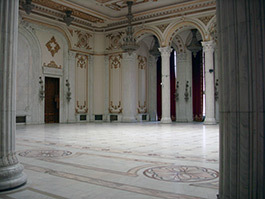 The floor in the central part of the gallery has the form of a carpet and it is made of white marble and beige “Caprioara” and it is decorated richly. The 34 columns that support the arches are octagonal-shaped and are made of white marble and pink marble from Ruschita, being carved with decorative elements. Here, as well, there are the two monumental stairs, each of them being accompanied with a 16 m tall window. 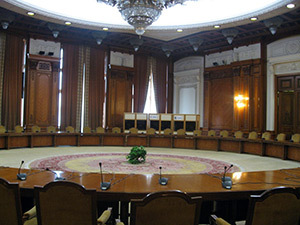 “Nicolae Balcescu” Hall – Palace of the Parliament. The hall bears the name of a great democrat and revolutionary politician, historian and philosopher, Nicolae Balcescu. 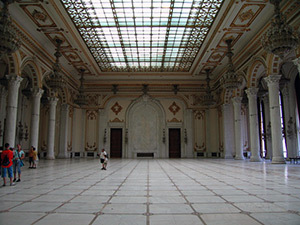 The columns are made of marble from Ruschita and the chandeliers were made by visual artists in Medias. The velvet curtains and the carpet adorned with flowers were woven at Sighisoara and Cisnadie. The doors are made of mahogany, which is a present received by Ceausescu from his friend, Mobutu Sese Seko, the president of Zaire (today Zaire is the Democratic Republic of the Congo). The hall bears Nicolae Iorga’s name, who was a writer, historian, politician, member of the Romanian Academy and prime minister in 1930. The ceiling and the walls of the hall are decorated with the same wooden essence, especially oak essence. The walls are adorned with works belonging to the following painters: Margareta Sterian, Nicolae Blei, Gheorghe Simion, Zamfir Dumitrescu. “Alexandru Ioan Cuza” Hall -Palace of the Parliament. The hall bears the name of the ruler of Walachia and Moldavia and it is situated in the main beam of the palace. It presents an eclectic architecture, as the main composition element of this hall consists of a column adorned with capitals arranged in the Corinthian style. The trunk of the column is adorned with traditional motifs specific to the Brancovenesc style. The doors are carved with decorative motifs, the curtains are woven with golden threads and on the background wall one may see an imposing central arch which is enclosed by two columns and whose contours are illuminated. 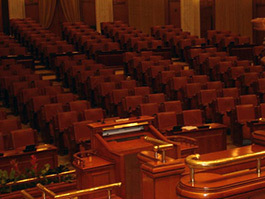 “Ion I. C. Bratianu” Hall – Palace of the Parliament. The hall is situated at the ground floor and has an average area. Its decoration is very rich, though: the ceiling and the floor have the same compositional features, and namely a big central rosette with geometrical elements which are made of marble assortments. The curtains are made of red velvet with silver and golden threads. 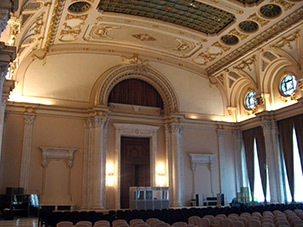 “C.A.Rosetti” Hall – Palace of the Parliament. The hall is used for exhibitions, markets, cocktails. Its decoration resembles the ancient oriental art. The ceiling is covered by a thin golden layer and the floor presents marginal ornaments dominated by geometrical and floral elements. In this hall, paintings and decorative works are exposed. The paintings are realized by various painters: Angela Bradean, Marian David, Vasile Celmare andmany others. 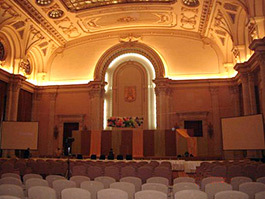 This is the show hall of the International Centre of Conferences that hosts conferences, concerts and theater plays. The grandest chandelier of the palace is placed here and it weighs 3 tones. The architecture is dominated by the Cubist style, ard-deco. The carpets are placed so that they form a semi-circle, just like the benches that circumscribe the central space. The Hall of the Union -Palace of the Parliament. It was projected for the great politicians, in fact for the ones that would have been checked in here. The columns present Romanian flutings and a Corinthian capital and are made of white marble from Ruschita. The walls have plaster mirrors with jambs made of white marble from Ruschita, which are richly decorated and the ceiling is made of glass. The doors are decorated with motifs inspired from the traditional Romanian architecture. 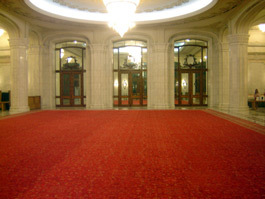 The carpet that covers the whole central part of the hall weighs 3 tones, but due to the fact that hall is required very often for markets and national and international exhibitions, the carpet is not always exposed. 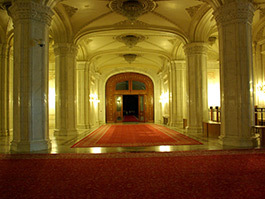 The entrance in the Palace of the Parliament. Inside the Palace of the Parliament. 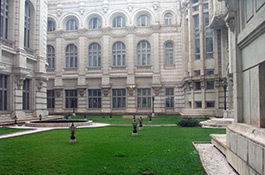 The Courtyard, Palace of the Parliament. 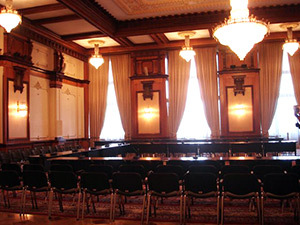 “Alexandru Ioan Cuza” Hall – Palace of the Parliament. 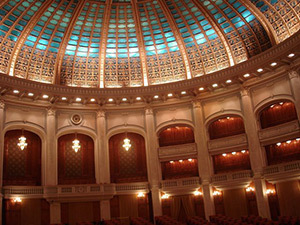 The Hall of the Union – Palace of the Parliament. 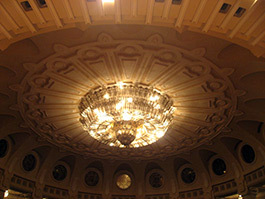 “C.A.Rosetti” Hall – the grandest chandelier of the palace is placed here and it weighs 3 tones. – Palace of the Parliament.